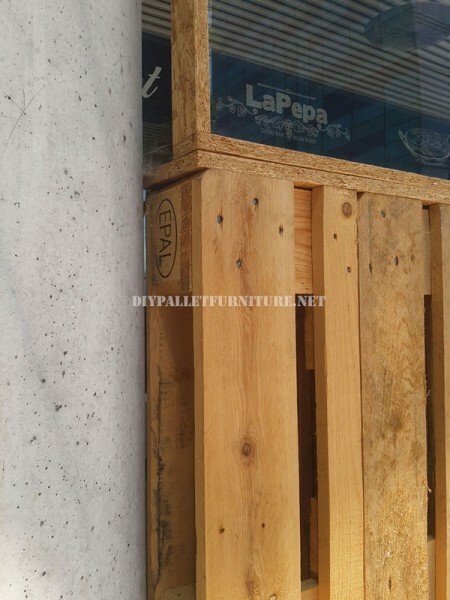 In the slow-food restaurant La Pepa, Barcelona, ​​seeking to delimit the terrace of this business, they have created an enclosure using the pallets, which also helps to give a greater discretion to those who are eating inside. The restaurant interiors are decorated in a very rustic style, we can even find some recycled furniture elements, one wall is completely covered with wooden wine boxes, so no wonder that they have decided to use pallets to decorate the bar. The fence was built using whole europallets with barely any change, and they have created a chipboard frame to include a glass, thus increases the height of the enclosure. Once we enter the terrace, the sofas that we can found have also been made with pallets. A very good initiative that offers great results with a minimal investment. Do you like this pallet furniture for a bar? Do you want to look for more pallet fences?